One of the most popular single malts in the World. In 1824 George Smith made a daring move and got a license to legally produce single malt Whisky. Needless to say, the neighbouring smugglers weren’t all too happy about it, so for protection he had to carry not one, but two guns at all times. Imagine that. The Glenlivet 12 Year Old is one of the most popular (and best-selling) single malts in the World. It was matured in a mixture of casks made from American and European oak. Using the mineral rich water from Josie’s Well ensures the best possible result during mashing and fermenting to form flavours defining this Highland Scotch. What does The Glenlivet 12 Year Old taste like? The Flavor Spiral™ shows the most common flavors that you'll taste in The Glenlivet 12 Year Old and gives you a chance to have a taste of it before actually tasting it. My introduction to Scotch, enjoyable but a bit rough, touch of medicine initially. Simply the smoothest, lightest and best tasting spirit I have ever tasted. I tried to like this whisky but after multiple drams, still can’t find anything distinctive about its taste. I found the taste monotonous and vaguely fruit but the finish oddly harsh. Plenty of others love this as a daily sip but it really didn’t work for me. Very sippable scotch. Very little bite and subtle flavors make it very easy to enjoy neat. Quickly becoming my new every-day sipper. This is my go to scotch when money is tight. It is actually the reason I fell in love with scotch in the first place. Great whisky all around. Smooth as its name claims. Great in a hot toddy, great over ice, and great on its own. One of my go-tos. One of my first whisky's. It will always have a special place in my heart. This is my go-to whisky. I can drink it neat, on ice, with a splash of water. It is a smooth, softly peated Scotch that is a wonderful welcoming to the world of Scotch. There's a reason it's famous. An excellent, straightforward scotch, perfect for introducing the uninitiated. It was my very first scotch, and I was grateful all the way through. Pleasant. Sweet, floral, ashy towards the finish. Velvet-smooth. The Scotch that made me realize that I don't particularly like Bourbon, and that not all whiskys are created equal. The original "go to" and my beginnings in Scotch. It's price and availability make it an easy choice but the taste is still there. Cleaner than other scotches but with still the aged deepness that relaxes you after a good meal or just a good day. Nice dram but the alcoholic taste is the overwhelming flavor. Sweet nose, pretty smooth to sip. I add a little ice - very drinkable. As others say, good go-to for basic scotch. Ripe and juicy apples and applewood on the nose! The palate is a little soft, showing honey, vanilla, and apricot notes. Decent but not spectacular. Nose is sweet. Pineapple was on the forefront followed by sweet fruit and vanilla. As it sat longer the vanilla tones continued to rise. First sip was smooth with a light mouth feel. As it went down the pure sweetness of the drink rose throughout. You could taste the honey, vanilla, and sweet fruit as it remained on the palate when finished. It’s a new go-to. my go-to scotch. a couple ice cubes to unlock it, and cut the bite. There is a reason it’s a classic. That’s all I can say. I have never had the opportunity to try their more aged varieties, but am looking forward to when I do. Very solid scotch, especially for the price tag. I will often use this to introduce scotch to someone who hasn't tried it. I love this because of the drinkabiltiy / it’s low in tannins which means I can drink it all night. Love this as a sipping scotch. Very smooth with a hint of warmth. The Gold Standard for Single Malt Scotch in my opinion. I grew up pouring my father and his poker buddies doubles and triples of this stuff in every form - highball glasses w/Perrier and crystal clear ice, neat in a rocks glass, shots to chase pints of red ale with; you name it, I've seen people drink Glenlivet 12 year with it. There are definitely smoother Scotch whiskies and those which have been aged longer or cost more, but this is the one I always keep stocked in my bar. It's the working man's Single Malt, and it's fantastically versatile. I recommend it with soda (a pressurized Perrier is my preference), a lemon twist, and two large cubes for parties (oh, and a dash of bitters if the drinker actually likes Scotch). A great way to introduce people to Single Malt without potentially wasting an expensive shot, and a light after taste that won't sting or bite the taste buds. Like I said, it's the Gold Standard. Perfect balance and smooth start to finish. Good starter Scotch. First Scotch I ever bought. Slightly smokey, with a bit of peat but does not have the Iodine smell or taste the some others have. Hey, it's a scotch! Glenlivet 12 year is a standard but for a good reason. A fruity scotch (no peat here) that tastes more alcoholic than it is. Actually, that's the main thing detracting from this younger variety. The overwhelming alcohol flavor overpowers much of what makes Glenlivet delicious and you'll be left wondering what was there that left such a great aftertaste. 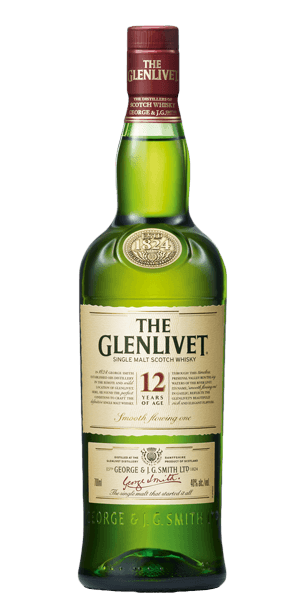 Glenlivet was my 4th Highland Scotch I tried, and it quickly became one of my staples. A fantastic scotch, that's smooth and sippable. Really smooth, great for sipping. I like the aroma (oak, hint of fruit) of the whisky, the flavor profile, and the bead effect. The whisky is a great spirit to introduce new whisky drinkers too, especially whisky's from Speyside. With that being said, there are better whiskies out on the market. But you can never go wrong having this in your stable. I am still new to scotch, but I do like this one, it is not heavy and woodsy or oaky like a lot of less aged scotch, and it is reasonably priced. A nice basic scotch. Nothing that sparks a wow factor but very drinkable. I will always be content with a glass. I dig this scotch. Simple. But done excellently. Not quite as smooth as expected but 2/3rds of it has disappeared down my gullet already so it must be doing something right! That was good but not as good as the 20 years old Scotch I drank in Germany almost 30 years ago. It is a good scotch. This is my Step-mom's families go to and there is always plenty at my Dad's house. It is a good standard scotch that is drinkable, but I prefer Oban. Easy drinking as far as whisky goes. Leaves a little 'fire' after each sip. I finally found a scotch that fits the hype. just like a whiskey has to be, smooth, light and full of charakter. This is a staple at my bar. Can't go wrong. For the price, I love this one. I love the fruit notes that come through. Good all around single malt. Smooth. Smell little mint. Taste honey with smoky fruits. Smooth at first with slow, small warm. Vanilla, fruity nose. Good introduction. Very simple not much there. A bit harsher than I cared for. The apple notes came very late for me and most flavors were overpowered by almost metallic burn. You may find it anywhere they sell Scotch, but it is a fine go to and I am never at home without it. Fruity, nice burn, vanilla and floral. Though sweet and fruity like most Speys, a bit harsh down the neck. Popular selling dram you can find just about anywhere, nothing special. It is a good everyday scotch. Definitely one of the bottles I always keep in my bar. Tried and true favorite, budget-friendly with near-perfect balance of spice, subtle burn, and a hint of sweet in nose, palette, and finish, consistently satisfying, and will always recommend. Their long-standing history of crafting single malt scotch alone should be a testament to the consistently delightful results in anything labeled Glenlivet. For the price, I challenge you to find a more complex and lasting finish than this. Не моя тема. Водянистый. Конечно фрукты и все такое. Но можно больше не брать. A widely available whisky for a reason. It's flavorful but not overpowering. It's a nice simple sipping dram, behaving much more like a bourbon than a scotch in terms of drinkability. Not peaty but a hint of smoke is pervasive. Lovely stuff. Nothing fancy here, typically found in most bars. Intense apple that dominates. Extremely smooth. Fairly smooth, fruits, short finish. Beautifully crafted light single malt whisky. I have been drinking this expression for 35 years. Always a delicious treat. One of my favorite Scotch whiskies. Lemon peal, semi sweet nose. Soft palate; pineapple like flavors. Finish a little rough. Some hot alcohol burn. A very good 12 year speyside, but this region must not be my cup of tea. Smells fruity, tastes smooth but can't taste the fruit.